Who is Howard Kaplan, the man? I seem to jump between spending a lot of time in my head alone and being very social at a party, though I’m never the center of attention. When younger no heads turned as I entered a room but I often left with the prettiest woman. I love getting off an airplane, good talk and cookies. I recently talked to a friend who was extolling the rewards of retirement and all his varied interests. I don’t have that many interests. My father is 99 and plays bridge five days a week so I feel I can continue to write for a very long time and the idea of stopping and retiring is frightening. 99 years old! You have to share his secret with us, and I'm glad to hear you don't plan on retiring yet. When did you start writing? In college I wrote a political play and turned it into three different classes the same semester. That was UC Berkeley. I got two A’s; the third professor declined to grade it but marked it as fulfilling the paper requirement. My college friends tell me, though I don’t remember, that I was always writing something even if it was long letters. I grew up an overweight child, shy and spent a lot of time in my room reading The Hardy Boys and watching TV. I’ve always liked stories. I still read and watch television a lot but now there are great shows on. I grew up with Nancy Drew and The Hardy Boys! What did you feel when you found out that authors can now self publish their books? Did you enter the scene immediately? 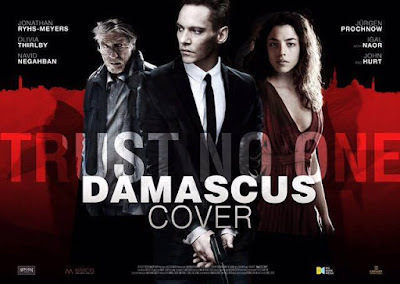 What really started me on self-publishing is that the director of the film adaptation of The Damascus Cover, which stars Jonathan Rhys Meyers and Sir John Hurt, asked me to bring the book out again as a companion to the film and give it some gravitas, so that tells you how Hollywood directors revere books. The book was long out of print, rights had reverted to me, so I began to explore how to self-publish it. I immediately faced a problem as it had been written before there were Word files, so I had to have someone retype the took into Word. But once I got started, I found self-publishing liberating. I control the book as well as much more of the proceeds which are both great. Self publishing is that. Liberating. That's why a lot of trads are shifting to the Indie scene. 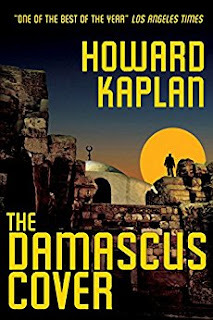 I understand that The Damascus Cover, which was an LA Times Bestseller, is now an award-winning major motion picture! 40 years after you published the book! Congratulations! Can you share with us how that happened? That's probably one of the things Indie Authors dream of. How did that change your life as a writer? Traditionally published, the book got excellent reviews and had a great run. Over time, it disappeared. Dan Berk, who adapted the feature film, had wanted to do a Middle East thriller and mentioned it to a friend of his who pulled down the old hardcover from her shelf and handed it to him. We met for coffee, we live near each other, and did a deal on the spot. So it wasn’t that an Indie book was plucked for a film, but once the film was on the horizon, we turned it into an Indie book. 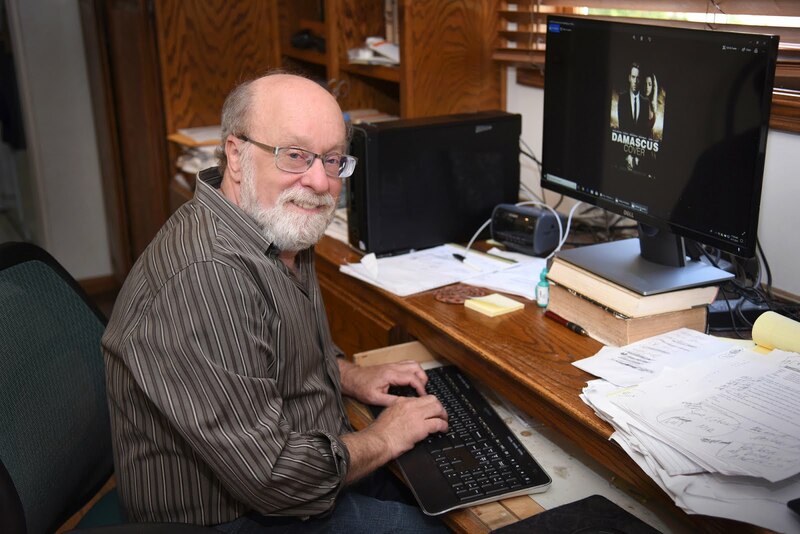 The film had a tremendous beneficial effect on my career, mostly in that I get a lot of interview requests which are hard to land for any kind of novelist, as media rarely covers even traditionally published novels unless you’re a superstar. My older novels are greatly about reconciliation, so in many ways they seem more timely now than when originally published. Do you think the movie is better than the book? Dan always says that the movie follows “the spine of the book”. I spent 10 days on set in Casablanca during the filming. Unexpectedly, every time there was a scene that was lifted exactly as it was in the novel, I kept thinking, “I should have written that better.” The new scenes I could enjoy far more easily as I wasn’t responsible for them. I’m fortunate that the movie turned out terrifically and is true to the book, something on both counts that doesn’t often happen. To have Sir John Hurt playing the head of Israeli Intelligence in his last film is a full on honor. And Jonathan Rhys Meyers is a fabulous actor and human being who brings passion both on and off screen. I’ve loved getting to know him. 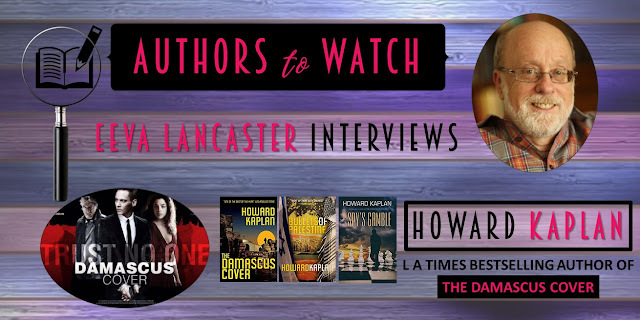 How did you get a review from Clive Cussler for The Damascus Cover? The book was on the LA Times Bestseller list for 3 months and I was invited to join a panel of authors and celebrities to address a book group of over 1,000 people at the Beverly Hilton Hotel in Beverly Hills. On the dais, they seated me next to Clive Cussler who then was promoting, Raise The Titanic. We struck up a friendship and exchanged letters about our early publishing rejections. If success is a mixture of skill and luck, that was a lucky evening. Indeed. I love his books. Why did you choose the Spy Thriller genre? I noticed that you love to write about Damascus, Syria, Cyprus, Palestine... What's your story? I’ve traveled a whole lot, both through the Arab countries and lived in Israel as a student. I love exotic locales and both have been to Damascus and spent a lot of time researching the city. When I wrote the novel I had a huge map of Damascus tacked to my wall to work with that I got by writing the Syrian Ministry of Tourism. I like to go to places and take notes and then supplement with research. The Brits have been everywhere and often have written memoirs. Once on Cyprus, I could not speak Greek, so the proprietor took me into the kitchen and lifted steaming pots. I chose lamb with green beans and worked that experience into The Damascus Cover. I was once sent to the Soviet Union to smuggle out a dissident’s manuscript on microfilm which I managed successfully. On my second trip to the USSR, I was arrested and interrogated for four days but luckily I had nothing incriminating on me and was released and followed in London as the KGB was more interested in who had sent me. Those following me ended up tied to trees naked in Epping Forest. So, moving to spy novels was a natural step and I’ve used in my novels much that I’d learned from these British associates in London. You live a very exciting life it seems, and it shows in your books. I'm enjoying The Damascus Cover immensely. Brings back the time when I was hooked on Ludlum's novels. Were you with a traditional publisher before? How do you feel about being an Indie Author? There are advantages to both. I miss having a hardcover in a bookstore and a mass market paperback in the airports, but the traditional waiting time from purchase to publication in traditional publishing is a year. I love being able to finish writing an Indie novel, and then being able to get it to readers very quickly. I’m not generally patient. I want to point out to those aching to be traditionally published that unless you receive a sizeable advance, your book can be greatly ignored --- so it is not a panacea. Yes, I think the expectations from being traditionally published is not very realistic. Do you have any tips for authors who also want their books to be discovered? I think one thing you can do is contact groups, say on Facebook, who are involved in your subject matter. If you’re writing say about U.S. Marshalls in Texas fighting neo-Nazis, you have groups of Marshalls, Texans, and those who fight neo-Nazis you can join and build relationships. In other words, don’t market it exclusively as a romance or thriller in a generic way, but also target specific groups with whom you feel your novel will resonate. That is great advise, Howard. Marketing is much broader than simple social media marketing. Are you releasing a new book anytime soon? Tell us about it. I have a new one coming very soon, The Spy’s Gamble, a thriller that moves through real events of 2016-2017 in the Middle East and at the same time takes the reader through the history of the Israeli-Palestinian conflict. One of the things I like to do in all my novels is bring in history to give people background into the conflicts my characters are charging through. It will be released on JUNE 5. Congrats on your new release! Where can readers find your books? My eBooks are on Kindle, Nook, iBooks and Kobo with paperback versions available on Amazon and Barnes and Noble. 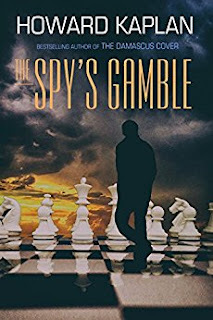 The Spy’s Gamble will be out initially exclusively on Kindle Select as it was chosen by Amazon in a preferential program. Thank you for the interview, Howard! Since you've reached this far, guys, here's a sneak peek at the movie trailer of DAMASCUS COVER. In theaters on July 20, 2018. 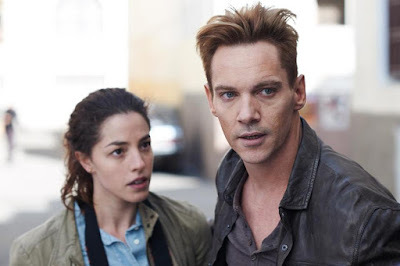 Starring Jonathan Rhys Meyers, Olivia Thirlby, John Hurt.